SAN ANTONIO, TX--(Marketwire - December 23, 2010) - Blow away the winter doldrums with a fun shopping excursion to San Antonio where great accommodations at an upscale San Antonio International Airport hotel and elite shopping districts are sure to bring a quick blast of relief from the winter blues. The exclusive "Shop 'til You Drop with the San Antonio Marriott Northwest" hotel package provides a full slate of fun-filled and relaxing amenities that are perfect for creating the ultimate shopping getaway. In addition to deluxe guest room accommodations, this shopping package includes breakfast for two, exclusive discount shopping coupons, a beverage voucher, private in-room viewing of a newly released movie and late 1 p.m. check-out -- all at rates starting as low as $129. Valid through March 19, 2011, this package is perfect for any special shopping occasion or taking advantage of post holiday sales, as well as typical winter and springtime sales events. As guests at one of the premier hotels near San Antonio International Airport, shoppers will find themselves conveniently located in the heart of San Antonio's popular shopping mecca which includes The Shops at La Cantera, Northstar Mall, Huebner Oaks, the Quarry and The Rim. The hotel's spacious and contemporary design and unique atrium lobby provide a relaxing atmosphere and with two on-site restaurants, guests have easy access to fine dining and delectable Southwestern cuisine that includes perfectly prepared Certified Angus Beef entrées. Accommodations for this North San Antonio hotel's shopping special may be booked online by using promotional code SHO at http://www.marriott.com/satnw or by calling 1-800-706-9963 for reservations and additional information. Guest rooms include the Marriott's popular Revive bedding ensembles with cotton-rich linens and pillow top mattresses for a relaxing night's sleep. In-room entertainment is provided over a 36-inch television and includes cable/satellite service and premium movie channels. *Rates are per room per night and valid seven days a week through 3/19/11 based on availability at the time of reservation. This offer may not be used for groups of 10 or more rooms or combined with any other discount or promotion. Please visit hotel website for additional terms and conditions. The San Antonio Marriott Northwest Hotel is conveniently located near the intersection of I-10 and Loop 410, making it a great hotel destination whether traveling for business or pleasure. While staying at this upscale San Antonio hotel near the Medical Center and popular area attractions including SeaWorld, Six Flags, The Alamo and Riverwalk, guests will find themselves surrounded by lavish amenities and unsurpassed services. 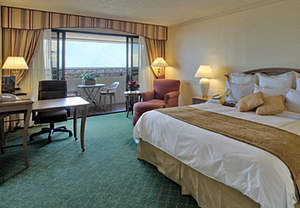 The hotel also offers complimentary airport shuttle and free on-site parking. All guest rooms are equipped as The Room That Works(R), featuring a large well-lit work desk, ergonomic chair, data ports, voice mail, and high-speed Internet access.